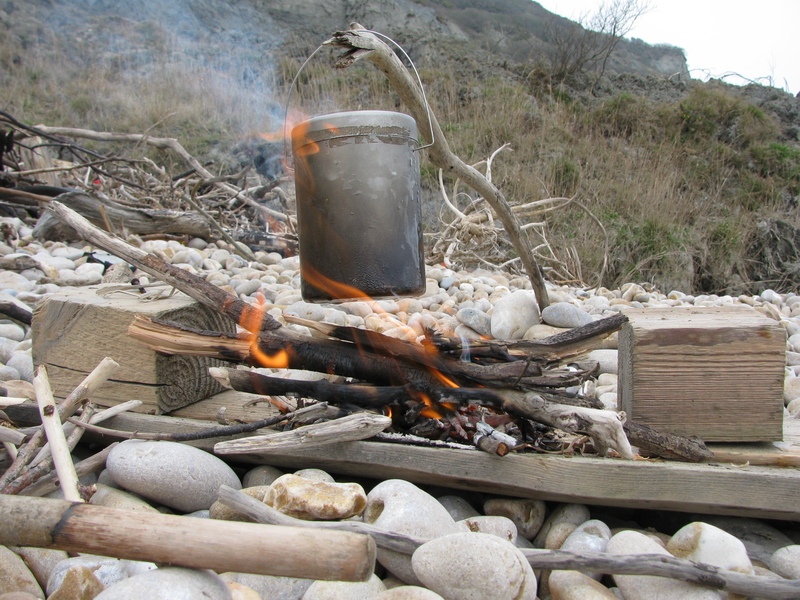 Home Coastal survival Why are Survival skills important? A fishing trip on a secluded beach or a coastal path walk could take an unexpected turn. 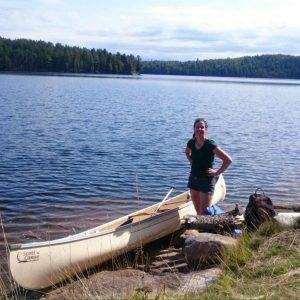 A twisted ankle on a solo trip or a casualty in your group can change the day into a serious scenario. 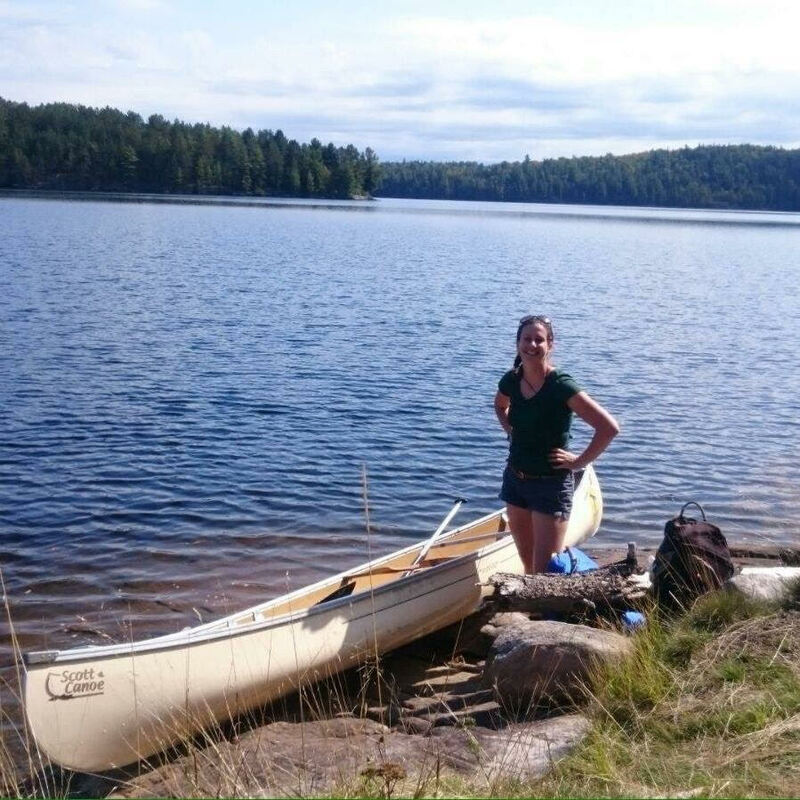 Being aware of the abundance of natural resources and how to use them instils a humble confidence in venturing out away from the comforts of civilisation and enjoying the peace and solitude in nature. Practising those skills will embed the knowledge that you may need to call upon and the Complete Coastal Survival Course teaches these fundamental skills for staying alive. Below is a taster of the information provided on the course concerning the four main survival elements; Shelter, Fire, Water and Food. Shelter is our first concern in a survival situation. Exposure to the blazing sun can result in sunstroke and dehydration. Rain and cold winds create a risk of succumbing to hypothermia. You’ll need a dry place to store kindling or firewood. 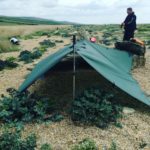 There’s not much natural shelter on the beach, in the way of trees or tall vegetation so knowing the best tips for setting up a tarp or shelter on the beach is key to staying in good physical condition. 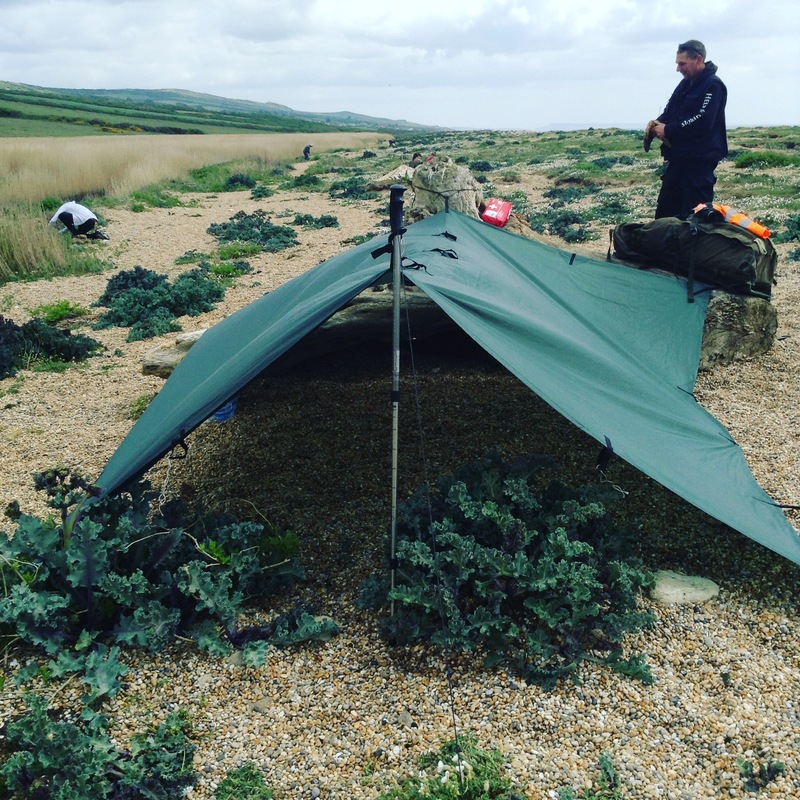 There are a few useful tips to effective tarp erection on the beach. Exposed beaches can be windy places. Position is key. Keeping the tarp low to the ground means there is less chance of the wind aggravating the structure and pulling at the anchors. A driftwood stick, or walking pole is useful for raising one end of the tarp and creating that stable triangle entrance. The pole can be wiggled down into the pebbles or sand for extra stability. The closed end of the tarp should be positioned against the prevailing wind. Wind direction can change very quickly however, so having a flexible setup and easily loosened knots allows quick re-positioning. Without the usual trees to secure the paracord the use of sand anchors becomes imperative. The edges of the tarp are tied with paracord and the end of the lines are secured using a ‘lark’s foot’ knot to a sturdy stick (think truncheon size). This stick is buried horizontally in the sand or shingle. With the line stretched out at a low angle from the tarp, this becomes a solid and effective anchor (and also works in snow). Try to work methodically when setting up a tarp. Set your height with the entrance stick. Work with opposite sides of the tarp out from the ridgeline. You may need to come back and adjust as necessary to make a good stable structure. There are many variations of tarp configuration, and practicing these setups and learning from your mistakes will keep you warm and dry when you most need it. Once you have your basic shelter, you can start to improve your sleeping arrangements. Reeds or even sticks can be used to raise your body up off the shingle, insulating you from the cold ground absorbing the heat from your body via conduction. Do you have any other good tips for setting up your tarp? What is a good way to avoid rain puddles when using the tarp low to the ground? Fire provides the heat that can be essential in a survival situation. Warding off hypothermia, drying out clothing, boiling water for safe drinking and cooking food add up to more chance of staying alive in an extended stay outdoors. The means to make fire should always be kept on you in the wilderness or where there is a risk that you may be isolated for some time. Carry several fire-lighting tools. • A lighter is great for a quick and easy flame, but cannot always be relied upon when wet. • A fire rod and striker which creates sparks will work even when wet, and will not run out of gas just when you need it. Directing the sparks exactly where you need them in your tinder is a skill that requires practice. • Intensifying the sun’s rays onto dry tinder or ‘punky’ wood, using a magnifying glass, or the end of a bottle can create an ember which can be transferred to a tinder bundle and blown into life. • Carrying a chemical firelighter is a good idea, one block can be cut into multiple tiny pieces. These pieces can be skewered onto the end of a small stick and used as a torch to light the prepared fire stack. Be thrifty and use as small a piece as possible. Blow it out when you have lit your fire, as the firelighter can be re-used. You don’t know how long you may need it. Along with the means to make fire, you’ll need some tinder. This is the material used for catching the spark or flame and igniting the main fire. Cotton wool pads (kept dry) are excellent tinder if natural resources are not on hand, or are wet. If using in conjunction with a fire rod, it is best to fluff up the fibres to increase the chance of successfully receiving the spark. Natural tinder includes dry dead stalks, fluffy seed-heads and wood that has rotted and become powdery and dry. The lee side of the tarp may be a good place to set up your fire. Ensure the fire is positioned more than an outstretched arm’s distance from the tarp and that there is room to exit the shelter without risking stepping in the fire. Fire stack preparation should be done before you create your flame. • Gather plenty of wood, dry if possible. Dry reeds are good for the smallest kindling. • Organise your wood into bundles according to size. • Create a base to lift your fire up off the cold damp ground. Where there are pebbles, there is the risk of them heating up and exploding. Using a large flat stone or several stones will create a barrier between the fire and the shingle. • Create a windbreak behind your fire. Again, large flat stones can be stood on their edges to create walls around the fire. Allow airflow into the fire, a few gaps in the corners is not a bad thing. • Utilising a stump or driftwood log as a backstop to your fire is a great way to create a windbreak that also provides fuel. It will hold onto coals that can be used to re-ignite the fire. • Creating a stack with wood placed in a triangle configuration allows good airflow up through the sticks, and an entrance in which to place the lighted tinder. • Feed your fire often. 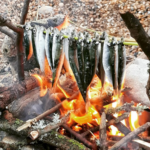 Being methodical and organised pays dividends; by adding a stick regularly and keeping the fire fed when cooking or boiling water, you can avoid the fire dying down and the extra effort needed for re-creating the fire from scratch. Store wood in your shelter so you always have the best chance of lighting a fire quickly. A large stone placed above your fire can mean you keep your fire blazing even in a heavy downpour. Water is more essential to your body than food. Estimates range from 2 days to 1 week that a person can survive without water, depending on the state of the body, weather and situation. • Collection of water is easier if you have a receptacle to hold it. Carrying a metal cup with you in your survival kit will allow you to collect and boil water from any freshwater sources nearby. • A solar still can be used to collect evaporated seawater, leaving the salt behind. Transpiration from plants can also be collected under plastic sheeting. • Dew can be collected in material during the night and squeezed out in the morning. Dew left behind on plants can also be utilised. • Rainwater harvesting using ponchos, tarps and other receptacles can provide fresh drinking water. Filtering of water collected from dubious sources aims to remove as many particles as possible. These particles may be harboring pathogens and bacteria. A plastic bottle cut in half, with the top inverted creates a funnel shape that can be filled with materials such as clothing fabric, reeds and small pebbles. Material at the bottom of the funnel (where the cleaned water will exit) should be the smallest. A cotton pad in first, followed by grasses stuffed in next, followed by reeds, then larger items such as pebbles will create a multi-layered system that filters out the larger particles first and the smaller particles last. The resulting water must still be boiled at a rolling boil of at least 3 minutes which will pasteurise the water for safe drinking. Coastal environments are often rich in wild edibles. Seaweed is an excellent fertiliser and the process of desiccation (drying out in the sun) breaks the seaweed down into a fine powder which is blown inland from the sea and creates an excellent growing medium for all sorts of vegetation. Micronutrients include minerals such as selenium, sodium, iodine, copper and zinc. These are abundant in seafood. Micronutrients also include vitamins such as vitamin C, A, D, E and K, as well as the B-complex vitamins. 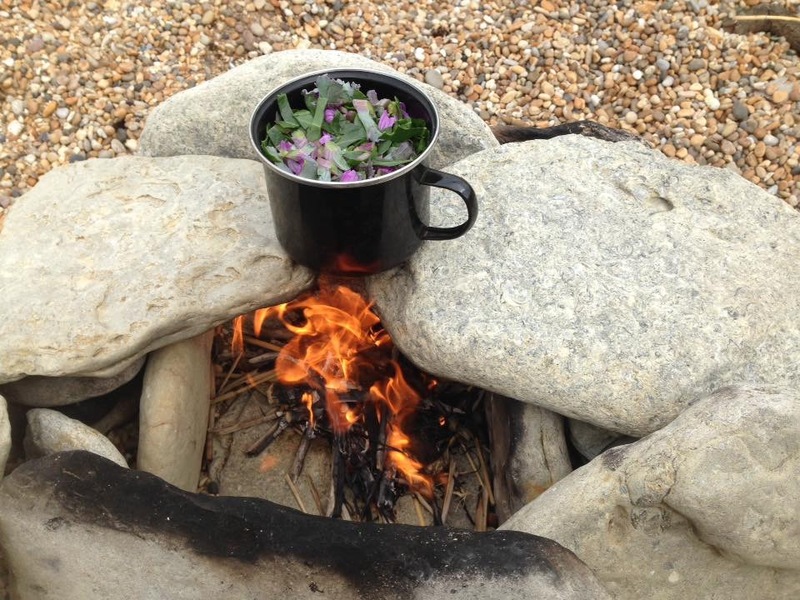 Sea spinach (sea beet) and scurvy grass are rich in many of these essential elements. Always follow a tolerance test when trying new foods. Cooking food is a good idea in a survival situation. Heat breaks down the carbohydrates into simple sugars that the body can more easily absorb. This reduces energy expenditure by the body in digesting uncooked food. High temperatures will also do a good job of killing pathogens and parasites that would be unwelcome invaders in an already compromised body. Care should be taken in sourcing food, avoid areas of stagnant water or collecting seafood from areas near sewage outlets. 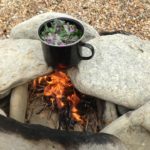 For more information on identifying and foraging the vast array of wild foods available on our coast, watch out for a future blogs or please check out our courses…. 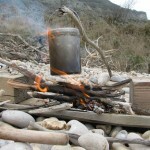 blog, Coastal Survival, fire, food, shelter, survival skills, water. Bookmark.